Our nurse today, Jess, told us that we should be dubbed honorary RNs because of everything we do in the hospital to help with Aidan's care; that felt pretty good! 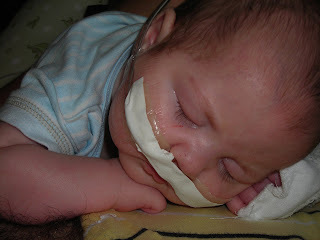 This morning Aidan's replogle seemed to be giving him issues so we told our nurse that we thought it should be changed. She had never changed a replogle before and we said we never had either, so we decided to all learn together :) Mike prepared all of the tape and i got all the supplies ready and while we were doing that the pediatricians came by on Rounds and decided to watch us all (some of them had never put a replogle in either so it was quite the experience!) Mike attempted and did a great job, but he could only get it to go as far as 7, and it needed to be at 11, so Jess stepped in and tried the other nostril and got it to 11 at the nare. Then we taped him all up and Aidan was as good as new. The peds then bumped him up to full (but continuous) feeds, so 27mLs an hour. Through the course of the day Aidan leaked only a teeny bit, nothing alarming so we are thinking he will be back to feeds every 3 hours by tomorrow afternoon. Back to the replogle, about a 1/2 hour after it got changed, Aidan sounded pretty gurguly and was fussy and spitting up alot of saliva; me being the paranoid mother sensed that something wasn't quite right. We got him hooked up to another vacuum with the "little sucker" attached, because the nasal aspirator just wasn't cutting it to get all the secretions. After doing that for about 1/2 hour he still didn't sound right. We had one of the peds come listen to him and she agreed that he definitely didn't sound clear like he usually does, so i got her to order an x-ray to make sure the replogle was in right(considering this was the first time for any of us) and that he hadn't aspirated into his lungs. After about 1 1/2 hours, Aidan sounded alot clearer and the x-ray had shown that it was in perfect position. We think that the replogle might have just irritated the esophagus and that caused all the extra secretions.